(1885-1985), Israel pianist. Born in Russia, Abileah gave his first concert at the age of six. He studied at the Conservatory of Petersburg under Marie Benoit, Liadov, and Glazounov and completed his artistic training in Geneva with Stavenhagen. He appeared as accompanist of Joseph *Szigeti, Joseph *Achron, and Maurice Marechal. In 1914 he was appointed chairman of the piano department at the Music Academy in Geneva, a position he held until 1922. He was active in 1922-26 as a piano teacher in Tel Aviv. During 1926-32 Abileah performed at concerts in Paris and New York. In 1932 he settled in Jerusalem where he was appointed professor at the Music Academy and, as chairman of the Musicians’ Association, organized chamber music concert series. He made recordings for the Israel Broadcasting Authority. "The [Divine] King is Father"), king of *Gerar, who appears in several incidents in connection with Abraham and Isaac. Each of these patriarchs, fearing for his personal safety, represents his wife as his sister. Sarah’s honor is saved through a dream theophany in which Abimelech’s life is threatened; timely detection of the subterfuge preserves Rebekah’s virtue. In both instances the king’s integrity is manifest and he is righteously indignant at the deceit (Gen. 20; 26:1-11). Abimelech is also involved with both patriarchs in quarrels over wells (21:25; 26:15-16, 18-21). In both events he is accompanied by Phicol, chief of his troops (21:22, 32; 26:26), and concludes treaties (21:27-32; 26:28-31). Also, Beer-Sheba figures on each occasion (21:31; 26:33). The detailed similarities between the two stories and the resemblances of both to that of Genesis 12:10-20 have generally led critical scholars to assign Genesis 20-21 to the e source and Genesis 12 and 26 to j, regarding all three narratives as variants of a single tradition. The name is ancient, and attested in the form Abi-milki as the name of the King of Tyre in the 14th century B.c.E., but because the Philistine migrations to Canaan do not antedate 1100 B.c.E., the title "King of the Philistines" (26:1, 8; cf. 18 -not in E) must be viewed as an anachronism. Abimelech was referred to as a righteous Gentile (Mid. Ps. 34). His attempted seizure of Sarah is explained by the fact that he was childless, and that he hoped to be blessed with offspring by marrying such a pious woman (pdRE 26). Among his punishments for his sin were that ruffians entered his house, that boils erupted on his body (Gen. R. 64:9), and that his household became barren (bk 92a). Abimelech, however, clearly did not consider himself to be the only one at fault. According to the aggadic commentary on his words "Behold it is for thee a covering of the eyes" (Gen. 20:16), he said to Abraham "You covered my eyes (i.e., by saying that Sarah was your sister), therefore the son which you will beget will be of covered eyes (i.e., blind)." This prophecy was fulfilled in Isaac’s old age (Gen. R. 52:12). The aggadic treatment of Isaac’s relations with Abimelech is briefer. It records that, although he had heard of Rebekah’s great beauty, Abimelech remembered his previous punishment, and therefore left her alone (Ag. Ber. 20). However, once Isaac had become so wealthy that people kept saying: "Rather the dung of Isaac’s mules, than Abimelech’s gold and silver," he became jealous, and claimed that Isaac’s wealth was derived from his favors (Gen. R. 64:7). (for meaning, see previous entry), the male offspring of *Gideon the Abiezrite by his Shechemite concubine (Judg. 8:31). During the period of the Judges Abimelech became the ruler of Shechem through the support of his mother’s family and the local oligarchy ("the lords of Shechem"; Judg. 9:2-3 et al.) who financed the hiring of a regiment of "worthless and reckless fellows" (9:4). With their aid, Abi-melech murdered all but one of the 70 sons of Gideon (see *Jotham) in order to eliminate possible claims to the leadership of Shechem. He had reason for apprehension because of Gideon’s special connections with this city. The Bible does not count Abimelech among the *Judges. He is not credited with having "saved" Israel. The placing of his story in the Book of Judges is apparently due to its connection with the traditions about the house of Gideon. At any rate, Abimelech maintained close ties with the Israelites, since he "ruled [not 'judged'] over Israel three years" (9:22). It is probable that the Manassites submitted to him because of his paternal lineage, though it is possible that he attained power solely by means of the support of his hired regiment. It would seem that Abimelech’s connection with the Israelites did play a decisive role in contributing to his election as a ruler of Shechem. The preservation of normal relations with Israel was of vital importance to Ca-naanite Shechem which existed as a foreign enclave within the boundaries of the tribe of Manasseh. According to the narrative, the "lords of Shechem" acclaimed Abimelech "king" over them (9:6). However, all indications point to the fact that the title "king" was used because of the lack of a more appropriate term for the type of ruler that existed in various cities in Syria and Erez Israel who performed the functions and exercised the authority of a king. A ruler of this kind was chosen by the municipal institutions. There is evidence that the ruler was dependent on the city’s institutions, which guarded their own status and power. Other non-monarchal rulers governed in Shechem at different times: Hamor the Hivite, ruler of Shechem in the days of Jacob (Gen. 34:2), was "chief of the country"; Lab’ayu, chief of Shechem during the 14th century B.c.E., known from the el-Amarna letters, was another such example. In the course of time a conflict arose between Abimelech and the "lords of Shechem," who had chosen him as their leader (Judg. 9:23). It appears that he wished to increase his power at the expense of the local oligarchy. The appointment of Zebul, who was among Abimelech’s most prominent supporters and who protected the latter’s interests in Shechem as "the ruler of the city" (9:30), testifies to these aspirations. According to the Bible, the "lords of Shechem" placed "men in ambush against [Abimelech] on the mountain tops" (9:25) in order to prove his incompetence in the delicate area of security and to remove him from power. They even conspired with *Gaal son of Ebed (9:26), a non-local and non-Israelite personage, who headed an army of his own and who seduced the Shechemite population by underscoring the city’s descent from Hamor the Hivite, its ancient founder (9:28-29). Possibly this reflects a split within the local population, part supporting Abimelech and part opposing him. Gaal apparently sought and found supporters among the Hivites (Horites) of Shechem, who were almost certainly a significant section of the city’s population. It is a fact that Abimelech lost support precisely among the "lords of Shechem." Since Abimelech had to be informed about the events in Shechem by Zebul’s messengers (9:31), it would seem that he was not a permanent resident but lived outside the city proper. Abimelech hastened to Shechem and attacked Gaal and his confederates (9:39-40). Abimelech’s supporters in Shechem drove Gaal from the city (9:41). The continuation of the story implies that Abimelech decided to turn the territory of Shechem into his private estate by conquest. He completely destroyed the city, slaughtered its inhabitants, and sowed it with salt (9:45). He then invested Thebez (9:50ft.). During the siege of the tower of Thebez he was mortally wounded by a millstone thrown down on him by a woman (9:53). Badly injured, he asked his armor bearer to slay him rather than let him die disgracefully at the hand of a woman (9:54). Although the story of Abimelech is episodic, it represents a shift in Israelite attitudes leading to the establishment of the monarchy. There is an obvious continuity between the Israelites’ request that Gideon be king over them and Abimelech’s status as ruler of Israel. Only the period of the consolidation of the monarchal concept in Israel separated Abimelech’s rule from the anointing of Saul. (Heb "my [or "the"] Divine Father is generous"; the root 211 is a common element in West Semitic names), the father of Eleazar, Ahio, and Uzzah, who resided in Kiriath-Jearim. The ark was brought to Abinadab’s home after its wanderings in the Philistine cities and remained there for a period of 20 years. When David undertook to move the Ark by oxcart to Jerusalem (11 Sam. 6:3-4; 1 Chron. 13:7), Abinadab’s son Eleazar was appointed to guard the ark (1 Sam. 7:1). Abinadab’s two sons, Uzzah (perhaps identical with Eleazar) and Ahio, marched the one beside or behind and the other in front of it. Josephus relates that Abinadab and his sons were Levites (Ant., 6:18; 7:79), a datum unsupported by other sources. (i535?-i605? ), rabbi, preacher, and biblical commentator. Abiob studied under Samuel *Medina, the greatest halakhic authority of his time. He was appointed rabbi, first in Salonika and subsequently in Constantinople and Uskub. Although a recognized authority in halakhah, he would refer cases which he did not wish to decide to his teacher in Salonika. His responsa frequently are quoted in the responsa of Samuel Medina and in those of Solomon b. Abraham Ha-Kohen of Serei. He published Shemen ha-Mor (Salonika, 1601), a collection of novellae of other commentators and his own exposition of rabbinic dicta in connection with the Book of Esther. He compiled commentaries on the Pentateuch, called Korban Aharon, developed from the discourses he delivered on Sabbaths and festivals. The work was never published and the manuscript is no longer extant. His commentary on Psalms, Beit Aharon, was also unpublished. His son Solomon succeeded him as rabbi of Uskub. (1922- ), Israeli aerospace engineer. Abir, who was born in Kaunas, Lithuania, and came to Palestine in 1934, was chief instructor of the Aero clubs of Palestine, which included the aviation unit of the Palmah (1943-46). He served in the Israel Air Force (1949-55) and was head of its engineering department in 1954-55. Abir was at the Haifa Technion from 1955 to 1972, serving as head of the department of mechanics in 1959-61 and then as dean (and professor) of the Faculty of Aeronautical Engineering (1962-64). He was employed at the British Aircraft Corporation, Bristol, U.K. (1964-65) as senior consulting assistant to the chief engineer on the Anglo-French Concorde supersonic aircraft project. Abir also worked (on leave from the Technion) at Israel Aircraft Industries Ltd., Engineering Division, in 1968-71, as director of advanced aircraft studies and chairman of research and development. He joined Tel Aviv University in 1972 as associate dean of the Faculty of Engineering (1972-80). Abir was deputy chairman of the Israel Space Agency, Ministry of Science and Technology (1983-87) and its director general in 1985-87. Abir was chairman of the National Committee for Space Research from 1972 and chairman of the National Committee on Data for Science and Technology from 1988, both at the Israel Academy of Sciences and Humanities. He served as president (1990-94) of the International Committee on Data for Science and Technology (co-data) of the International Council of Science (icsu), Paris, France, and was a member of the Council of the International Committee on Space Research (cospar) of icsu from 1972. He was a founding member of the Tel Aviv Academic College of Engineering (from 1996) and served as its deputy president for academic affairs (until 2002). Abir was a fellow of the Royal Aeronautical Society, London, U.K. (from 1965) and a member of the International Academy of Astronautics, Paris, France (from 1972). He contributed papers and articles and wrote and edited books and journals in the fields of aerospace and technology. He was active in the creation of Hebrew terminology in the aviation and related fields, in conjunction with the Israel *Academy of the Hebrew Language and other organizations. Father (? )"; meaning unknown; of *Shunem), an unmarried girl who was chosen to serve as sokhenet to King David. The term comes from a root skn, "attend to," "take care" and its noun forms can be applied to high officials in Hebrew (Is. 22:15) Abishag’s role was of a lower status. She served as bed companion to David in the hope that her fresh beauty would induce some warmth in the old man (i Kings 1:1-4, 15), and as his housekeeper. The notice (1:4) that "the king knew her not" serves less to impute decrepitude to David than to inform the audience that there would be no other claimants to David’s throne than Solomon and Adonijah. When Solomon became king, *Adonijah, whose life Solomon had spared although he knew him to be a dangerous rival, asked *Bath-Sheba, Solomon’s mother, to intercede on his behalf for permission to marry Abishag. Solomon correctly interpreted this request for the former king’s concubine as a bid for the throne (See ii Sam 12:8; 16:20-23), and had Adonijah killed (i Kings 2:13-25). Some see in Abishag, who is described as "very fair" (i Kings 1:4), the Shulammite of the Song of Songs (Shulam-mite being regarded as the same as Shunammite). The aggadah identifies Abishag as the Shunammite who gave hospitality to Elisha the prophet (pdRE 33). It relates that she was not half as beautiful as Sarah (Sanh. 39b). The fact that David did not make Abishag his legal wife is explained as due to his refusal to exceed the traditional number of wives (18) allowed to a king (Sanh. 22a, and Rashi, ibid.). Solomon’s action is also vindicated on the grounds that the request made by Adonijah to be permitted to marry Abishag (i Kings 2:13 ft.) represented a true threat to Solomon’s position, as it is only the king, and not a commoner, who is allowed to make use of the servants of the deceased king (Sanh. 22a). The son of Zeruiah, brother of *Joab and *Asahel and nephew of David. Abishai was one of David’s most loyal military officers. He was one of David’s three mighty men and is credited with killing 300 people (11 Sam. 23:18). Additionally, he is said to have been the head of this group, and according to some versions he was the head of the thirty heroes (11 Sam. 23:18; 1 Chron. 11:20). Abishai was one of the three generals who defeated Ish-Bosheth, Saul’s son, and Abner, the commander of Saul’s army. After the battle Abner killed Asahel (11 Sam. 2:18ff.). According to 11 Samuel 3:30, Abishai and his brother Joab eventually avenged their brother’s death. However, the Septuagint apparently did not hold them responsible for this murder, reading arevu ("lie in wait") instead of haregu ("killed") of the masoretic text. David, nevertheless, certainly thought both of them guilty (11 Sam. 3:39). Abishai defeated the Canaanite confederation against David (11 Sam. 10), and during Absalom’s revolt he commanded one-third of David’s forces (11 Sam. 18:2). Additionally, he was instrumental in suppressing Sheba, the son of Bichri (11 Sam. 20:6-10). He was also one of David’s leading generals in other wars with the Philistines (11 Sam. 21:15-17) and the Edomites (1 Chron. 18:12); he rescued David at Nob from the threats of a Philistine giant, who has been referred to in some sources as Ish-bibenob (11 Sam. 21:16-17); and he was against the king’s policy of making peace with his enemies (11 Sam. 16:9-10, 19:23). Abishai’s suggestion to kill Saul in his camp was refused by David (1 Sam. 26:6ff.). Abishai’s rescue of David (11 Sam. 21:16-17) illustrates his piety and valor. David had been enticed over the Philistine border by Satan and there seized by Ishbibenob, the brother of Goliath. This was miraculously revealed to Abishai while he was bathing in preparation for the Sabbath. He was aided in his search for David by the fact that the earth contracted under him. On his way he encountered and slew Orpah. When Ishbibenob saw him approaching, he planted his spear in the ground and threw David up in the air saying: "Let him fall on it and perish." Abishai, however, pronounced the Divine Name, and David remained suspended in the air until he descended safely in answer to a prayer of Abishai. Abishai and David foiled the final attack of the enraged giant by weakening him with taunts about his mother’s death at Abishai’s hands (Sanh. 95a). Abishai was equal to 70,000 men of Israel (Mid. Ps. 17:4). Moroccan family of rabbis, dayyanim, talmudists, and jurists, who led the community of Sefrou. Information about the Abitbol family is found in many Moroccan documents (responsa, collections of letters, etc. ), mostly unpublished. The British Museum houses a bulky manuscript (Mar-goliouth, Cat, 4 (1935), 161, Or. 11, 114), entitled Sefer Iggerot u-Melizot, containing poems, but mainly the exchange of correspondence between Moroccan rabbis between 1760 and 1810. The manuscript contains valuable information on the history of Moroccan Jewry in general, and the Abitbol family of Sefrou in particular. (1) saul jeshua ben Isaac (c. 1740-1809), called Rav Shisha (the Hebrew initials of his name). Rav Shisha became rabbi and dayyan in Sefrou at the age of 18, and served for 50 years. His rabbinical decisions were honored in rabbinical courts in Morocco during and after his lifetime. His responsa were collected by his descendants and published in Jerusalem under the title Avnei Shayish (19301, 19342). The second volume also contained a collection of biblical and talmudic glosses, sermons, etc., entitled Avnei Kodesh, which are not his work, but that of another rabbi of Sefrou, Jekuthiel Michael El-baz. The poet David Hasin composed two piyyutim to honor him and his son Raphael (cf. Tehillah le-David, 1787). Jacob Berdugo mourned his death in a dirge (cf. Kol Ya’akov,1844). (2) amor ben solomon (1782-1854), Moroccan scholar, codifier, and dayyan. Born in Sefrou, Abitbol maintained a yeshivah there at his own expense and supported needy scholars. Many communities turned to him with their halakhic problems. His voluminous library contained many rare manuscripts, among them hundreds of letters addressed to him and to his father from all parts of North Africa, particularly Morocco (Ms. British Museum no. Or. 11. 114; a second group is the Benayahu collection). These contain important information about valuable works and manuscripts. Some of his own and his father’s responsa were published as Minh at ha-Omer (1950). This volume includes a collection of his homilies, Omer Man, and 26 of his poems and elegies, including one bakashah in Arabic. Other responsa by him are scattered throughout the works of his Moroccan contemporaries. Some of his works are still in manuscript. His two sons, H ayyim Elijah and Raphael, were also well-known rabbinic scholars. (16th century), liturgical poet who lived in Algiers. His father Abraham b. Meir Abi Zimra, born in Malaga, author of some poetical compositions, came "from the bitter expulsion of 1492 to the city of Tlemcen" (Abraham Gavison, Omer ha-Shikhh ah, 1748, 134a). Abraham Gavison, who knew Isaac, called him "the great poet" (ibid., 122b). Over 60 of Isaac’s piyyutim, which were strongly influenced by Arabic poetry, are to be found in various manuscripts. Until recently, various communities in North Africa recited his poems. A complete edition of poems was prepared by H.J. Schirmann, but never published. (formerly Abkhaz Autonomous Soviet Socialist Republic), within Georgia, Transcaucasia, on the eastern shore of the Black Sea. Formerly part of the Ottoman Empire, Abkhaziya became a Russian protectorate in 1810. During the czarist regime, since it lay beyond the *Pale of Settlement, Abkhaziya was barred to Jews from European Russia. In 1846 Jewish artisans were given permission to live temporarily in Sukhum (now Sukhumi), the main city, and by 1897 there were 156 Jews. After the 1917 revolution the number of Jews in Abkhaziya increased considerably. The 1959 census recorded 3,332 Jews (0.8% of the total population), 3,124 living in urban settlements and 208 in rural. The majority were concentrated in Sukhumi and most of them were Georgian Jews (see *Georgia). A new synagogue with accommodation for 500 congregants was built in 1960, and a congregation was reported active in 1963. After the dismantling of the Soviet Union in the 1990s, Abkhaziya proclaimed independence and cessation from Georgia, leading to a war in 1993 that ended with the defeat of the Georgian army and Russian troops intervening and separating the belligerents. The war caused the Jews of Abkhaziya to leave, mostly for Israel. Abkhaziya is not recognized by other governments as an independent country. (Heb. "immersion"), act of washing performed to correct a condition of ritual impurity and restore the impure to a state of ritual purity. The ritually impure (or unclean) person is prohibited from performing certain functions and participating in certain rites. Ablution, following a withdrawal period and, in some cases, other special rituals, renders him again "clean" and permitted to perform those acts which his impurity had prevented. Ablution must not be confused with washing for the sake of cleanliness. This is evident from the requirement that the body be entirely clean before ablution (Maim., Yad, Mikva’ot 11:16), but there may nevertheless be some symbolic connection. The ablutions, as well as the impurities which they were deemed to remove, were decreed by biblical law, and understood by the rabbis in religious and not in hygienic or magical terms. This is shown by R. Johanan b. Zakkai’s retort to his disciples who had questioned an explanation he gave to a non-Jew about ritual purity: "’The dead do not contaminate and the water does not purify.’ It is a command (gezeirah) of God and we have no right to question it" (Num. R. 19:4). Ablution is common to most ancient religions. Shinto-ists, Buddhists, and Hindus all recognize ablution as part of their ritual practice and there is ample evidence concerning its role in ancient Egypt and Greece (Herodotus, 2:37; Hes-iod, Opera et Dies, 722). Most ancient peoples held doctrines about ritual impurity and ablution was the most common method of purification. In varying forms ablution is important to Christianity and Islam as well; this is hardly surprising since they are both post-Judaic religions. In Jewish history there have been several sects that have laid great stress on the importance of ablution. The *Essenes (Jos., Wars, 2:129, 149, 150) and the *Qumran community (Zadokite Document, 10:10ff. ; 11:18ff. and other Dss texts) both insisted on frequent ablutions as did the Hemerobaptists mentioned by the Church Fathers. The tovelei shaharit ("morning bathers") mentioned in Tosefta Yadayim 2:20 perhaps may be identified with the latter but more likely were an extreme group within the general Pharisaic tradition (Ber. 22a; Rashi, ad loc.). In the Jewish tradition there are three types of ablution according to the type of impurity involved: complete immersion, immersion of hands and feet, and immersion of hands only. In the first type of ablution the person or article to be purified must undergo total immersion in either mayim hayyim ("live water"), i.e., a spring, river, or sea, or a *mikveh, which is a body of water of at least 40 seahs (approx. 120 gallons) that has been brought together by natural means, not drawn. The person or article must be clean with nothing adhering (h azizah) to him or it, and must enter the water in such a manner that the water comes into contact with the entire area of the surface. According to law one such immersion is sufficient, but three have become customary. Total immersion is required for most cases of ritual impurity decreed in the Torah (see *Purity and Impurity, Ritual). Immersions were required especially of the priests since they had to be in a state of purity in order to participate in the Temple service or eat of the "holy" things. The high priest immersed himself five times during the service of the Day of Atonement. Other individuals had to be ritually pure even to enter the Temple. However, it became customary among the Pharisees to maintain a state of purity at all times, a fact from which their Hebrew name Perushim ("separated ones") may have developed (L. Finkel-stein, The Pharisees (19623), 76ff. ; R.T. Herford, The Pharisees (1924), 31 ff.). Total immersion also came to form part of the ceremony of *conversion to Judaism, although there is a difference of opinion concerning whether it is required for males in addition to circumcision, or in lieu of it (Yev. 46a). Since the destruction of the Temple, or shortly thereafter, the laws of impurity have been in abeyance. The reason is that the ashes of the *red heifer, which are indispensible for the purification ritual, are no longer available. Thus, everybody is now considered ritually impure. The only immersions still prescribed are those of the *niddah and the proselyte, because these do not require the ashes of the red heifer and because the removal of the impurity concerned is necessary also for other than purely sacral purposes (entry into the Temple area, eating of "holy" things). The niddah is thereby permitted to have sexual relations and the proselyte is endowed with the full status of the Jew. In addition to the cases mentioned in the Bible, the rabbis ordained that after any seminal discharge, whether or not resulting from copulation, total immersion is required in order to be ritually pure again for prayer or study of the Torah. Since this was a rabbinical institution, immersion in drawn water or even pouring nine kav (approx. 4^2 gallons) of water over the body was considered sufficient. The ordinance was attributed to Ezra (bk 82a, b) but it did not find universal acceptance and was later officially abolished (Ber. 2ib-22a; Maim., Yad, Keri’at Shema 4:8). Nevertheless, the pious still observe this ordinance. The observant also immerse themselves before the major festivals, particularly the Day of Atonement, and there are hasidic sects whose adherents immerse themselves on the eve of the Sabbath as well. The Reform movement, on the other hand, has entirely abolished the practice of ritual ablution. There was a custom in some communities to immerse the body after death in the mikveh as a final purification ritual. This practice was strongly discouraged by many rabbis, however, on the grounds that it discouraged women from attending the mikveh, when their attendance was required by biblical law. The most widespread custom is to wash the deceased with nine kav of water. The immersion of the niddah and the proselyte require *kavvanah ("intention") and the recitation of a benediction. The proselyte recites the benediction after the immersion because until then he cannot affirm the part which says "… God of our fathers … who has commanded us." Since ablution at its due time is a mitzvah it may be performed on the Sabbath, but not, nowadays, on the Ninth of Av or the Day of Atonement. Except for the niddah and the woman after childbirth whose immersion should take place after nightfall, all immersions take place during the day. Vessels to be used for the preparation and consumption of food that are made of metal or glass (there is a difference of opinion concerning china and porcelain) and that are purchased from a non-Jew must be immersed in a mikveh before use. This immersion is to remove the "impurity of theGentiles" (a conception which was introduced, perhaps, to discourage assimilation), and is different from the process of ritual cleansing by which used vessels are cleansed to remove non-kosher food which might have penetrated their walls. This immersion is also accompanied by a benediction. This second type of ablution was a requirement for the priests before participating in the Temple service (Ex. 30:170".). This is by far the most widespread form of ablution. The method of washing is either by immersion up to the wrist or by pouring % log (approx. V2 pint) of water over both hands from a receptacle with a wide mouth, the lip of which must be undamaged. The water should be poured over the whole hand up to the wrist, but is effective as long as the fingers are washed up to the second joint. The hands must be clean and without anything adhering to them; rings must be removed so that the water can reach the entire surface area. The water should not be hot or discolored and it is customary to perform the act by pouring water over each hand three times (Sh. Ar., oh 159, 1960, 161). The handwashing ritual is commonly known as netilatyadayim, a term whose source is not entirely clear. It has been suggested that netilah means "taking" and thus the expression would be "taking water to the hands," but the rabbinic interpretation is "lifting of the hands" and is associated with Psalms 134:2. Washing the hands is a rabbinic ordinance to correct the condition of tumatyadayim, the impurity of the hands, which notion itself is of rabbinic origin. Among the biblical laws of purity washing the hands is mentioned only once (Lev. 15:11). According to one tradition "impurity of the hands" (and washing them as a means of purification) was instituted by King Solomon, while another has it that the disciples of Hillel and Shammai were responsible for it (Shab. 14a-b). It seems that the custom spread from the priests, who washed their hands before eating consecrated food, to the pious among the laity and finally became universal. The detailed regulations concerning "impurity of the hands" constitute one of the 18 ordinances adopted in accord with the opinion of the school of Shammai against the school of Hillel, and it met at first with considerable opposition. In order to establish the practice the rabbis warned of dire consequences for those who disregarded it, even going so far as to predict premature death (Shab. 62b; Sot. 4b). R. Akiva, who personally disapproved of the ordinance, nevertheless used the limited water allowed him in prison for this ablution rather than for drinking (Er. 21b). In the New Testament there are several references which suggest that Jesus and his disciples demonstrated their opposition to rabbinic authority by disregarding this ordinance (Mark 7:1; Matt 15:1; Luke 11:37). The washing of the hands most observed today is that required before eating bread, although according to rabbinic sources washing after the meal before grace is considered at least of equal importance. The reason given for this latter washing is to remove any salt adhering to the fingers which could cause serious injury to the eyes (Er. 17b). It is possible that these washings derive from contemporary Roman table manners, and there is also mention of washing between courses (mayim emza’iyyim, Hul. 105a). In modern times, priests have their hands washed by the Levites before they perform the ceremony of the Priestly Blessing during public prayer services. The laver thus has become the heraldic symbol for the Levites and often appears on their tombstones. Washing the hands is required on many other occasions, some of which are motivated by hygienic considerations and others by superstitious beliefs. A list of occasions for washing the hands was compiled by Samson b. Zadok in the 13th century: they include immediately on rising from sleep (in order to drive the evil spirits away), before prayer, after leaving the toilet, after touching one’s shoes or parts of the body usually covered, and after leaving a cemetery (Tashbaz 276; Sh. Ar., oh 4:18). The fact that ablution was so widespread in ancient religions and cultures makes it likely that the Jewish practice was influenced by contemporaneous cults. It is, however, difficult to ascertain the extent of this influence and it is possible that the rabbis were reacting against contemporary practices rather than imitating them. It is clear that, to the rabbis, the main purpose of any ablution was to become "holy" and the system they created was meant to keep the Jew conscious of this obligation. "’(God is the hope [Hebrew "mikveh"] of Israel)’ (Jer. 17:13); just as the mikveh cleanses the impure so will God cleanse Israel" (Yom. 85b). Immersion for women following menstruation and childbirth is a rabbinic, not a biblical, requirement. The halakhic regulations appear particularly in tb Niddah, which discusses the practical consequences for male ritual purity of women’s menstrual and non-menstrual discharges. On the eighth "white day," following the cessation of menstrual flow, the wife must immerse in the mikveh (ritual bath) before marital relations can resume. Jewish girls were traditionally taught to comply strictly and promptly with the regulations connected with the niddah (the menstruating woman). Ablution, which took place only after the body and hair had been thoroughly cleansed, had to be complete. Halakhah demanded a single immersion but three became customary. Post-menstrual and post-par-tum women usually visited the mikveh at night, often accompanied by other women. In the first half of the 20th century, female ritual ablution declined significantly in North America, even among nominally traditional families, despite Orthodox exhortations in sermons and written tracts on the spiritual and medical benefits of taharat ha-mishpahah (family purity regulations), as these laws came to be called. Factors militating against ritual immersion included disaffection of Americanized children of immigrants with their parents’ Old World ways, the success of liberal forms of organized Judaism that did not advocate such ablutions, and the deterrent effect of ill-maintained and unhygienic mikvaot. Many Jewish feminist writers of the late 20th century also condemned taharat ha-mishpahah regulations as archaic expressions of male anxiety about the biological processes of the female body that reinforced the predominant construction in rabbinic Judaism of women as other and lesser than men. The 1980s and 1990s saw a resurgence in the numbers of Orthodox Jews and a new sympathy among non-Orthodox denominations for various previously discarded practices of traditional Judaism. In this era, positive new interpretations of ritual ablution developed, accompanied by construction of attractive modern mikvaot. Orthodox advocates of taharat ha-mishpah ah regulations praised the ways in which they enhanced the sanctity of marriage and human sexuality and extolled the feeling of personal renewal and rebirth that followed each immersion. At the beginning of the 21st century, ritual ablution became a symbolic expression of a new spiritual beginning for both women and men in all branches of North American Jewish practice beyond the domain of taharat ha-mishpah ah. In addition to conversion to Judaism, rituals developed incorporating mikveh immersion as part of bar mitzvah and bat mitzvah (coming of age); before Jewish holidays; prior to marriage; in cases of miscarriage, infertility, and illness; and following divorce, sexual assault, or other life-altering events. An indication of the probable long-term impact of this trend was the increased construction of mikvaot by non-Orthodox communities. (Heb cousin of King *Saul and "captain of his host" (1 Sam. 14:50-51); from 1 Chronicles 8:33 it would appear that Abner was Saul’s uncle. At court he occupied the seat of honor next to Jonathan, the crown prince (1 Sam. 20:25). In his conflict with Saul, David seems to have suspected Abner of plotting against him (24:10; 26:19). Abner did in fact accompany Saul in his pursuit of David, who taunted him with not guarding his master properly (26:16). After the death of Saul and three of his sons on Mount Gilboa, Abner made Saul’s son *Ish-Bosheth king over Israel with his capital at *Mahanaim in Transjordan, while Judah broke away and elected David as their king in Hebron (11 Sam. 2:8-11). During the subsequent warfare between Israel and Judah, Abner and his men were routed by David’s captain, Joab, at the Pool of Gibeon; Abner killed Joab’s younger brother Asahel, but reluctantly and in self-defense. He then made a moving appeal to Joab to stop the fratricidal combat (2:12-32). Abner was reproved by Ish-Bosheth for having lain with Rizpah, the daughter of Aiah, a concubine of King Saul, thus possibly betraying his own aspirations to the kingship (3:7). In his anger Abner communicated with David and conspired with "the Elders of Israel" and Saul’s own tribe of Benjamin to offer David the crown of a reunited Israel (3:i2ff.). At Hebron he and his son were well received and entertained, while his enemy Joab was away (3:20). Abner promised to rally the entire nation around David. On his return Joab reproached David and warned him against Abner’s intrigue. Without the king’s knowledge he lured Abner back to Hebron and murdered him at the city’s gate (3:30). In this act he also avenged Asahel’s death and rid himself of a potential rival, as David had probably promised the chief captaincy to Abner in return for making him king over all Israel. Shocked by this treacherous deed, David cursed Joab and his house. He had Abner buried with full honors; his beautiful dirge and tribute to Abner, "A prince and a great man has fallen this day in Israel," became famous (3:3iff.). On his deathbed David charged his son Solomon to avenge Abner’s murder (1 Kings 2:5, 32). According to one tradition Abner’s tomb is in Hebron near the cave of *Mach-pelah. Abner, a giant of extraordinary strength (Eccles. R. 9:11) was the son of the Witch of En-Dor (pdRE 33). It was he who refuted Doeg’s argument against the admission of Moabite women "in the assembly of the Lord" (see Deut. 23:4) and, supported by Samuel, he established the rule "a Moabite but not a Moabitess," thus enabling David to reign over Israel (Yev. 76b). Abner justified his slaying of Asahel as an action in self-defense, but since he could have merely wounded him, Abner deserved his violent death (Sanh. 49a). Although a pious man (Gen. R. 82:4) and a "lion in the law" (tj Pe’ah 1:1, 16a) Abner was guilty of many misdeeds which warranted his death. It was in his favor that he had refused to obey Saul’s command to kill the priests at Nob; but he should have intervened actively and prevented Saul from executing his bloody design (Sanh. 20a). Even if Abner could not have influenced the king in this matter (ibid. ), he was guilty of having frustrated a reconciliation between David and Saul and of thinking little of human life (tj Pe’ah 1:1, 16a). However he was right in espousing the cause of Saul’s son Ish-Bosheth against David for he knew from tradition that God had promised two kings to the tribe of Benjamin, and it was therefore his duty to transmit the throne to the son of Saul the Benjami-nite (Gen. R. 82:4). (also Alfonso of Valladolid or of Burgos; c. 1270-1340), apostate and anti-Jewish polemicist. Abner was practicing as a physician in Burgos in 1295, at the time of the appearance of the false prophet in *Avila. Some of those who had been confused by miraculous portents they had witnessed came to Abner for medical advice. Their reports shook Abner’s own faith in Judaism, which was already troubled by doubts. The phenomenon of the sufferings of the Jews in exile and of the righteous had long disturbed him, and he experienced visions which he was unable to interpret. Finding no solution in the Bible or the doctrines of the Jewish and Arab philosophers, he turned to the New Testament and the works of the Christian theologians. Abner wrestled with this problem for 25 years. Jewish scholars tried to restore his faith, but he eventually became converted to Christianity when he was about 50. Some time after his conversion, he sent his disciple, Isaac b. Joseph ibn *Pollegar (Pulgar), a copy of a pamphlet setting forth his messianic theories. Pulgar responded with a work which he circulated among the Jewish communities in Spain. Abner subsequently published a number of books and tracts written in Hebrew and directed to Jews. Some were later translated into Castilian under his supervision. He also engaged in his old age in oral disputes with Jewish scholars, including *Moses b. Joshua of Narbonne. In 1334 he tried to convince the elders of Toledo that they had erred in fixing the date of Passover. Abner was among the first apostates to formulate an ideological justification for conversion. He rejected the rationalist interpretations of the Torah current in his day and avoided taking a stand on the *Kabbalah, which was known to him. The theological system which he propounded accepts predestination, identified with astrological influences, as well as philosophic determinism. The theories expressed in his Iggeret ha-Gezerah ("Epistle on Fate") combine astrology with the doctrine of fatalism of Muslim theologians and the Christology of Paul and Augustine. Abner found the answer to the problem of salvation – individual salvation as well as the salvation of all Christians, who alone truly deserved the name "Israel" – in the doctrines of the Trinity and Incarnation, which he tried to ascribe to Aristotle and the aggadic Midrashim (following Raymond *Martini’s Pugio Fidei). He proposed harsh measures for dealing with the Jewish question, including conversionist preaching, isolation of the Jews from the Christian population, and stirring up mob violence. These proposals he justified by means of malicious allegations about the Talmud. Following the example of the Karaites, Abner alleged that the Talmud contained an evil "Ten Commandments." He employed Karaite arguments against the Talmud in addition to the criticisms of contemporary rationalists and did not shrink from publishing blatant forgeries. He repeated current slanders that the Jews displayed a hostile and unethical attitude toward Gentiles and gave them a sharper edge. Some of Abner’s works have not yet been published and others have been lost, including his Milhamot Adonai ("Wars of the Lord") which he wrote in Hebrew and translated into Castilian at the request of the Infanta Dona Blanca. Preserved in Castilian translation are Abner’s major work Moreh Zedek ("Teacher of Righteousness"), under the title Mostrador de Justicia, and his tract Minh at Kenaot ("Offering of Zeal"), directed against Isaac Pulgar. In the original Hebrew are Sefer Teshuvot li-Meharef ("Refutation of the Blasphemer"), a reply to Pulgar and other minor polemics. Pulgar assembled his arguments against Abner in his Ezer ha-Dat ("Aid to Faith"), in which, as customary in the works of other polemicists, he quotes from Abner’s writings. H asdai *Crescas, in his Or Ado-nai, quotes whole passages from Abner’s works in order to refute them. Subsequently, the apostates *Solomon ha-Levi of Burgos (Pablo de Santa Maria) and Joshua Lorki (Geronimo de Santa Fe) drew upon Abner’s arguments. In conjunction with the Pugio Fidei of Raymond Martini, Abner’s writings served as source material for later polemics against Judaism in Spanish Christian literature in general. Spanish family whose descendants remained prominent among the Sephardim of the Mediterranean world as well as in the ex-Marrano communities of Northern Europe. The origin of the name is obscure. The family produced many outstanding Jewish scholars in Spain (see Isaac Aboab, I and ii). After the expulsion from Spain, it was found in North Africa, Turkey, Italy (where the form Aboaf became common), and elsewhere. Some members of the family, who fell victims to the forced conversion in Portugal in 1497, preserved the name in secret, resumed it when they reentered Judaism (sometimes with the addition of their baptismal surnames, e.g., Fonseca, Dias, Falleiro) and became outstanding in the communities of the Marrano Diaspora (see Samuel *Aboab, Isaac *Aboab de Fonseca). abraham, formerly Gonfalo Cardozo, who traded with the Iberian Peninsula under the name of Dionis Genis, was one of the deputies of the Jewish community of Amsterdam in 1638. elias conducted a printing establishment there in 1643-44, and daniel semah practiced medicine after graduating at Utrecht in 1667. david, a convert, made his name in England by some pretentious publications, including Remarks on Dr. SharpesDissertations … concerning… Elohim and Berith (London, 1751). He is possibly identical with the david, born in Italy, who was excommunicated in Curasao in 1746 after a bitter controversy with the rabbinate. Members of the family resident in Brazil in 1648-54 included moses, who later found his way to New York, where he is recorded in 1684. moses, formerly of Surinam, conducted learned religious discussions at Leghorn and elsewhere with the Christian scholar Veyssiere de la Croze, who described them in his Entretiens sur divers sulets … de critique et religion (Amsterdam, 1711?). (c. 1555-1628), protagonist of Judaism among the Crypto-Jews. The little that is known about his life is derived from his major work Nomologia, and from his letters to many Crypto-Jews in Western Europe. He was born in Porto into a New Christian family, his father being Henrique Gomes (Isaac Aboab). 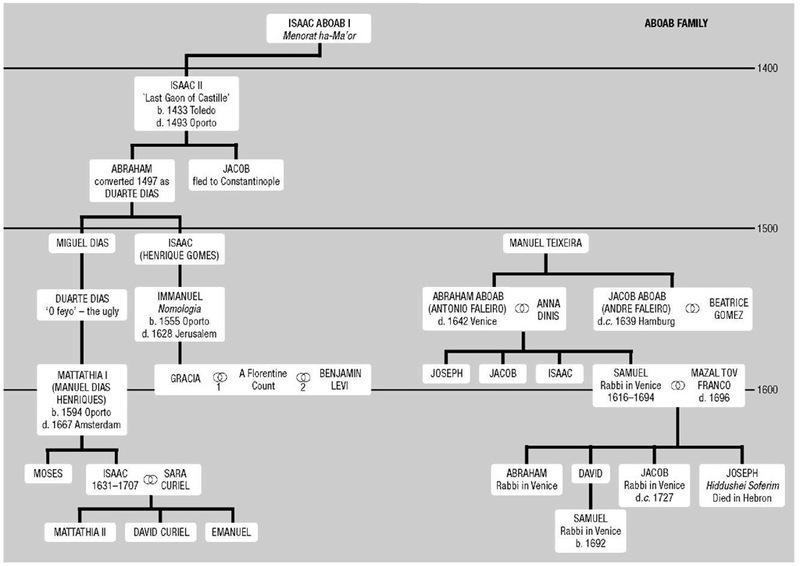 After his father’s death when he was quite young, he was brought up by his grandfather Du-arte Dias (Abraham Aboab, son of Isaac *Aboab 11 "the last gaon of Castile"; see accompanying genealogical tree), who negotiated with the Portuguese authorities for the entrance of the Castilian refugees into the country and was subsequently a victim of the forced conversion of 1497; he mentioned his grandfather quite often. In 1585 Aboab escaped to Italy, where he professed Judaism and studied Hebrew literature. In 1597 he had a religious discussion with an Englishman at Pisa; at the time he was one of the parnasim of the community, where his signature appears on some of the ordinances in 1599; subsequently he was in Reggio Emilia (where he was in contact with the kabbalist Menahem Azariah da *Fano) and Ferrara, where he had a debate with a Christian scholar on the translations of the Bible, claiming that the Hebrew version is the authentic one. He then moved to Spoleto, and later to Venice, where he is said to have delivered a discourse on the loyalty of the Jewish people before Doge Marino Grimani and the Grand Council in 1603. Four years later he was at Corfu, where he appeared on important business before the Venetian commander Orazio del Monte, with whom he later carried on a correspondence on the nature of angels. He probably spent some time in North Africa and Amsterdam. In Venice he became the hakham of the Spanish and Portuguese community until his departure to Israel late in life with a party of 36 relatives to join his daughter Gracia, who maintained two academies, in Safed and Jerusalem, and was in charge of the money collected for the support of the scholars. Aboab was a vigorous defender of Judaism, especially among his fellow Marranos who, while skeptical of Christianity, did not appreciate Jewish tradition. In the last years of his life, he wrote a forceful letter to a Marrano friend in France urging him to return to Judaism. The letter was filled with learned arguments and illustrations from history and was used in manuscript by later scholars. His principal work was his Nomologia o Discursos legales, written in Spanish between 1615 and 1625 in Venice, a defense of the validity and divine origin of the Jewish tradition and the Oral Law, published posthumously by his heirs (Amsterdam, 1629; 2nd ed. by I. Lopes, ibid., 1727).Aboab claimed that the Written and Oral Laws were inseparable. Displaying a wide knowledge of Talmud and Kabbalah as well as Latin and secular learning, it includes much valuable historical information, especially about scholars who left Spain and Portugal after the expulsion. In chaper 29 Aboab conducted debates with two such Jews who denied the validity of the rabbinic traditions. His letters sent to Converso or ex-Converso acquaintances are a valuable source of information on the religious, theological, and social problems they encountered in Jewish communities where they settled. Aboab strongly criticized those who returned to the Iberian Peninsula after their difficult experience as Jews. His literary and religious projects were interrupted by his death in Jerusalem. (end of the 14th century), rabbinic author and preacher; probably lived in Spain. His father seems to have been called Abraham and may have been the Abraham Aboab to whom *Judah b. Asher of Toledo (d. 1349) addressed responsa (Zikhron Yehudah, 53a and 60a). After devoting most of his life to secular affairs Isaac turned to writing and preaching. Isaac’s fame rests upon his Menorat ha-Maor ("Candlestick of Light"), one of the most popular works of religious edification among the Jews in the Middle Ages. Written "for the ignorant and the learned, the foolish and the wise, the young and the old, for men and for women" the work has had over 70 editions and printings (ist ed. Constantinople, 1514; Jerusalem, 1961) and has been translated into Spanish, Ladino, Yiddish, and German. Moses b. Simeon Frankfort of Amsterdam, who translated the work into Yiddish and wrote a commentary on it (Nefesh Yehudah, Amsterdam, 1701 and many subsequent eds. ), also edited a shorter version under the title of Sheva Petilot ("Seven Wicks" Amsterdam, 1721; Sudzilkow, 1836). The book became a handbook for preachers and served for public reading in synagogues when no preacher was available. Isaac wrote his book, apart from its practical aim, to return aggadah to its rightful place. Complaining that, because of lack of order in the sources, aggadah had been neglected in favor of legal casuistry, he argues that aggadah is an essential part of rabbinic tradition, as necessary for man as hala-khah. According to Isaac, the aggadah carried the same authoritative weight as halakhic rabbinic writings. Thus, the reader is expected to believe that the aggadah is true, just as the halakhah is true. It has been suggested that he wanted to provide a structured compilation of aggadah, similar to that which Maimonides, in his Mishneh Torah, had provided for the halakhah. Developing the image of the seven-branched candlestick (cf. Num. 4:9), Isaac divides his work into seven nerot ("lamps"). These, in turn, are subdivided into main divisions, parts, and topics. Using the three parts of Psalms 34:15 as general headings, he assigns the seven lamps to them in the following manner: (a) "Depart from evil," (1) guard against envy, lust, ambition; (2) be wary of sins attendant upon speech. (b) "Do good," (3) observance of mitzvot such as circumcision, rearing of children, prayer, festivals, honoring parents, founding a family, charity, justice; (4) study of Torah; (5) repentance. (c) "Seek peace and pursue it," (6) peace and love for fellowman; and (7) humility. Into this rather loose framework lsaac fitted a wealth of agga-dic material, culled from the Talmud and the vast midrashic literature. His use of passages from aggadic works now lost and the variants in the talmudic and midrashic texts he cites make the Menorat ha-Maor of great importance for establishing the text of the Talmud used in the Spanish-North African academies as distinct from that of the Franco-German school. Isaac is selective in using esoteric texts, and he fights shy of statements that may provoke doubt and heresy. While he agrees with Sherira Gaon that some of the sayings of the rabbis are imaginative exercises, he wants to limit their number. He contends that the great majority of aggadic statements are divinely inspired and, hence, beyond questioning. If they appear strange to us, it is because of our limited understanding. Isaac also quotes from the geonic literature, Alfasi, Rashi, the tosafists, Abraham Ibn Ezra, Maimonides, Abraham ibn Daud, Jacob Anatoli, Jonah of Gerona, Nahmanides, Isaac ibn Latif, and Solomon b. Abraham Adret, the ritual compilations of Abraham b. Nathan of Lunel (Ha-Manhig) and (David) Abudarham, Bahya’s Hovot ha-Levavot, Joseph Gika-tilla’s Sha’arei Orah, Asher b. Jehiel, and Jacob b. Asher’s Tur. He often neglects to name the author from whose work he quotes, and his materials are derived many times from secondhand sources. The Menorat ha-Maor is above all an ethical religious treatise. When discussing religious practices such as circumcision or Sabbath and Festival observances, Aboab limits himself to their underlying reasons and general importance. In his speculative views he combines the teachings of Maimonides, whose Mishneh Torah and Guide he cites constantly, with the ideas of the teachers of Kabbalah, though the complete absence of quotations from the Zohar has puzzled some scholars. In contrast to Maimonides he postulates that God’s individual providence for man is unconditional. Isaac recognizes the need for the study of general sciences, of which, according to him, the rabbis of old were masters, and he quotes Plato, Aristotle, and "the physicians who have recently emerged among the Gentiles." He also reflects the rabbis’ ambivalent attitude to this world and the next: on the one hand, this world is merely a preparation for the next; on the other hand, the Jew must enjoy this world and the life given by God for serving Him and his fellowman. In the "Introduction" Isaac mentions that he had written two halakhic works: Aron ha-Edut ("Ark of Testimony"), whose talmudic materials are arranged according to the Ten Commandments with the opinions of the geonim and later commentators in the margin; and Lehem ha-Panim ("Showbread"), devoted to prayers and blessings (unique manuscript in Schocken Library, Jerusalem). The traditional portrait of Isaac Aboab is actually that of Isaac Aboab da Fonseca.